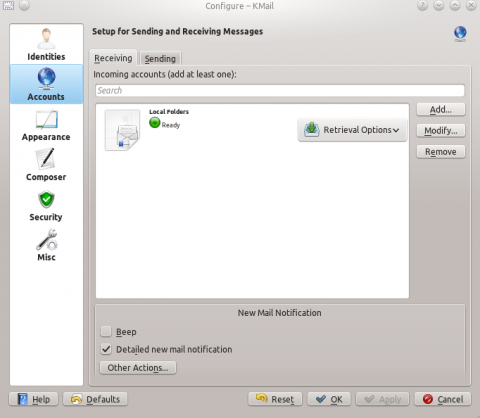 We know that KDE has an email client called KMail. The most popular platform that it can be used on is Linux. 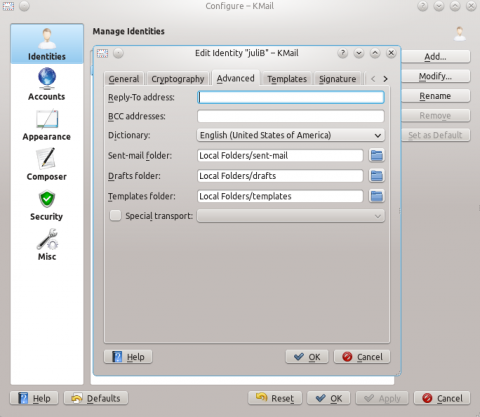 you can install the distribution’s package of kdepim or Kmail. First of all, you have to open the email client. can choose to Modify this identity with the button you'll see on the right. Lets say that you have a @gmail.com and a @yahoo.com address.No matter what address you're sending email from, you can receive your messages to a selected email address by going to Identities -> Modify -> Advanced and at Reply-To address you can write the address where you want to receive your messages. After you have completed creating an Identity, you need to add an Account . You want to select the Accounts icon on the left of the Kmail configuration window, and then click on the "Add" button. You are in the Receiving tab, which means that you are creating accounts that receive messages. I'll show you some examples of how i've set up my account. First of all, you got to decide which protocol you wish to use to receive your messages.The two most common are IMAP and POP3. This page was last modified on 1 December 2011, at 16:19. Content is available under Creative Commons License SA 4.0 unless otherwise noted.